Lace High-Heels Flats Crystal Bridal Pregnant Pump White Wedding Shoes. Bridal Lace White High Wedding Bridesmaid Shoes Pump Shoes Heel Pearls. Bridal Foam Elegant Hand Glitter Rose Bridesmaid Corsage Wedding Wrist Flower. Brand new hand braided lace front wig. Grab the corner of the wig. Put the wig on your head. Hold down with one hand and pull back the wig with one hand. Material: chemical fiber. Intranet: front lace stretch net. All hair is stuffed into the hair net. 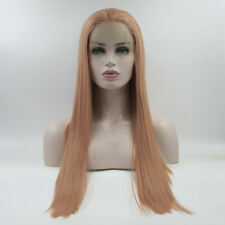 This wig features a high-quality "skin top", which gives the wig a look of naturalness and reality. Color:Light blonde. With a wig-centering design, It was made of high temperature wire, Therefore ,it can be straightened by hair sticks. Hair Texture: wavy. Lace Material&Color: Swiss Lace in dark brown. Cap Construction: Lace Front. Parting: Customized middle parting, but you can free parting on lace area. Net Weight: 360g. Size of the cap.